At least 108 people have been killed in Australian wildfires that the country’s public broadcaster Sunday called the worst in the nation’s history. Kendra Jackson, leading senior constable of Australia’s Victoria state police, told CNN the latest death toll Sunday. The number of dead is now far higher than the toll of 75 in the Ash Wednesday fires of 1983. Close to 200,000 hectares (500,000 acres) of land have burned. Thousands of weary firefighters spent Sunday fighting a losing battle to contain the flames. “It’s an absolute feeling of helplessness,” said Michelle Achison, who lives in a suburb of Victoria, the state most affected. “There are communities that are completely flattened. There’s nothing at all. And each and every one of us knows somebody who will lose everything.” The death toll seemed to rise every hour Sunday as rescue workers discovered more bodies. Some victims perished inside cars while trying to flee the flames. Others had stayed put inside houses that were burned to their shells. Watch as deadly fires rage » “I’ve heard of sad stories of flames going over cars and maybe one person surviving,” Dr. John Coleridge of Victoria’s Alfred Hospital told reporters Sunday. “I suspect today they will find lots of cars with people who haven’t survived.” iReport.com: ‘Thank God we were spared’ Hospital officials treating burn victims said the wounds were the worst they have seen since the terrorist bombings in the Indonesian island of Bali in 2002. “Hell and all its fury has visited the good people of Victoria in the last 24 hours,” Australian Prime Minister Kevin Rudd told reporters while touring the fire-ravaged areas. Watch as officials react to wildfires » Rudd announced the creation of a AU$10 million ($6.7 million) relief fund to immediately assist the more than 600 families that have lost homes to the blaze. He also promised troops would be deployed to help fight the flames. All day Sunday, winds fanned flames into local towns, where the blazes spread with frightening speed, devouring homes. Residents — with handkerchiefs covering their faces — pointed garden hoses at the flames or tried to stamp out hotspots with towels and clothes, but to no avail. Photos: Bushfires leave path of destruction » “All I got left is what I stand in and a bag,” a woman told the Australian Broadcasting Corporation, before breaking down. “My house. My house of 25 years is gone. I worked so hard for that house.” No one in the area was unaffected. John Brumby, the premier of Victoria, said the fire stopped just outside his parents’ house in the western part of the state. “There was a intense few hours for me,” he told ABC. “I was too far away to get there, four hours away. Dad’s in his early 80s, mom a bit younger. But we couldn’t get them on the mobile (phone), we couldn’t get them at home. No one knew where they were.” So many people have brought donations to relief centers in Victoria that the police have asked them to stop. “Police appreciate that people want to help the victims of the fire,” senior constable Wayne Wilson said in a statement, but added: “The number of people bringing items to the centers is causing difficulties in the operation of these centers.” As darkness descended, the flames continued to lick the night sky. Aerial views showed rivers of orange trickling in all directions amid the dense vegetation. “You look up at the sky and there’s this orange glow. It’s eerie,” said Ethan Alexander, a Melbourne photographer who visited some of the affected areas. More than 640 houses had been destroyed, said Sharon Merritt of the country’s Fire Protection Association. 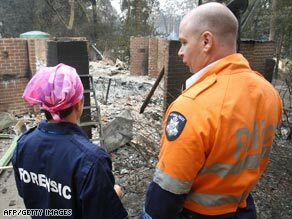 Victoria police are investigating the possibility that at least two of the fires were set deliberately, said Superintendent Ross McNeill, adding that no arrests had been made. Kieran Walshe, the deputy police commissioner for the state, said: “When you look at the way fires started, you can clearly see it’s not possible for a natural ignition to occur.” A man was charged with lighting fires in the neighboring state of New South Wales, police there said. The 31-year-old Killarney Vale man was due in court Monday after being arrested on Saturday, they said. The largest blaze was centered in the Kinglake area, about 80 km (50 miles) northeast of Melbourne, the Australia’s second most populated city and the capital of Victoria. One silver lining amid the devastation: the fires have not posed a significant threat to more populous areas, including Melbourne, as they sweep across rural outskirts of southeastern Australia, Walshe said. Still, said Achison, the Victoria resident, the state is so dry from lack of rain that there are no safe areas. “Last night, there was a grassfire on flat dry grass on one of the properties. And within minutes, six homes in a row were burned to the ground,” she said. “These weren’t people who were preparing to evacuate because they were told they weren’t in any danger.” Wildfires are an annual event in Australia. But this year, a combination of factors has made them especially intense: a drought, dry bush and one of the most powerful heat waves in memory. Temperatures in parts of Melbourne reached 48 degrees Celsius (118 degrees Fahrenheit) in the last few weeks. Dozens of heat-related deaths have been reported. By Sunday, the temperatures had dropped to the mid-20s in the area. Officials were hoping for some help from milder weather moving in. Droplets of rain had started to fall in some areas. Northern Australia, on the other hand, is grappling with a different problem. Sixty percent of the state of Queensland was flooded, officials reported, and residents were warned to be on the lookout for crocodiles in urban areas.